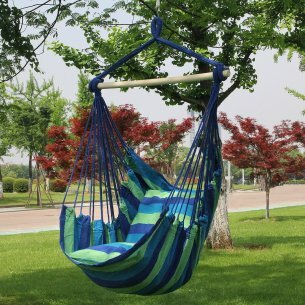 This comfortable and trendy hammock swing is the perfect addition to any indoor or outdoor space. 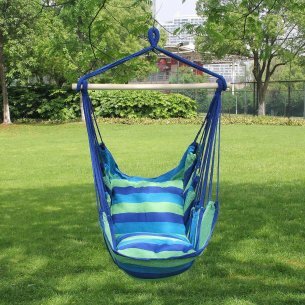 Hammock swing is paired with back support and two seat cushions for optimal relaxation. 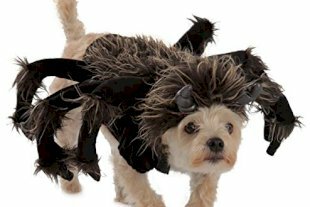 It is made of sturdy cotton and polyester fabric which can be machine washed. This is a great piece for stylish outside lounging or to accent a child's bedroom. Hammock can be hung anywhere and holds up to 265 pounds. Hanging hardware NOT INCLUDED. Overall dimensions: 40X50" excluding rope - cushion dimensions: 17X17" - wooden bar dimensions: 1X31.5".